On the way home after our last trip to White Sands, which I wrote about in my previous post, we stopped at Three Rivers Petroglyph Site. 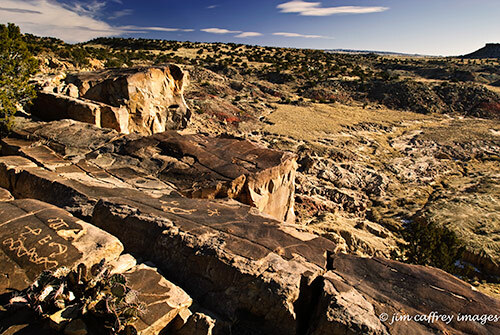 Three Rivers is located about sixteen miles north of Tularosa, New Mexico, and is administered by the BLM. 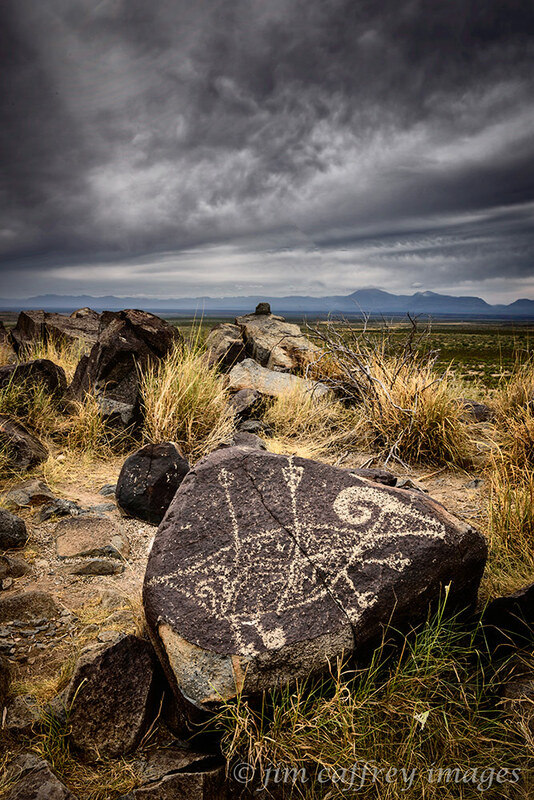 It has one of the largest concentrations of rock art in the American Southwest–more than twenty-one thousand glyphs. 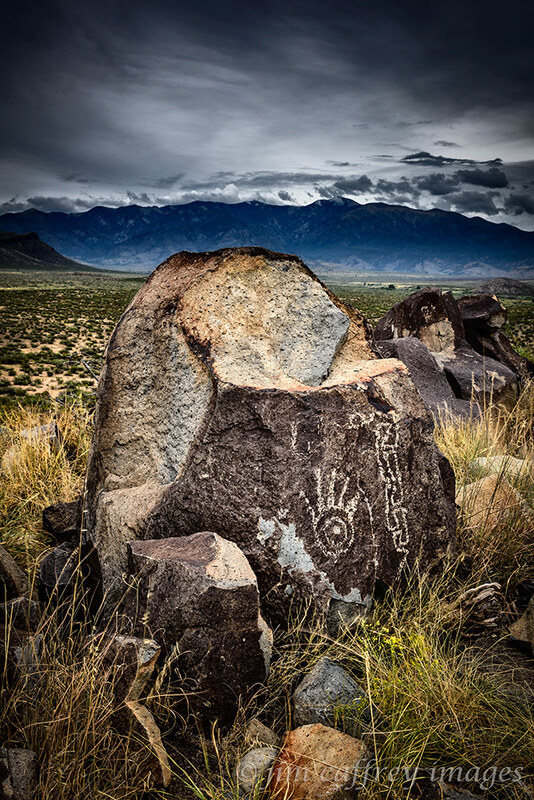 The petroglyphs were made by a now extinct culture, the Jornada Mogollon, who inhabited the area from 900-1400CE. They are the same people who lived at the more well known Gila Cliff Dwellings located about two hundred miles west. I always feel a connection when I see evidence of these ancient people’s existence. I imagine them there in the dim past, standing in this same spot and creating their art. Many of the petroglyphs at Three Rivers can be seen along the one mile trail which follows a basalt ridge. The artists used stone tools to carve their works into the dark patina covering the rocks; and in some places, nearly every square inch of available “canvas” is covered with drawings. Visiting such a place makes me realize that, as an artist, I am a member of a long line of humanity that has felt the need to express their interpretation of things or events which defined their lives. Were these artists-of-their-day respected members of the clan? Were they rebels? Did they rail against social injustice? The real significance of these works, aside from recounting the lives of a long lost culture, is their ability to connect us, as people, across the chasm of time. 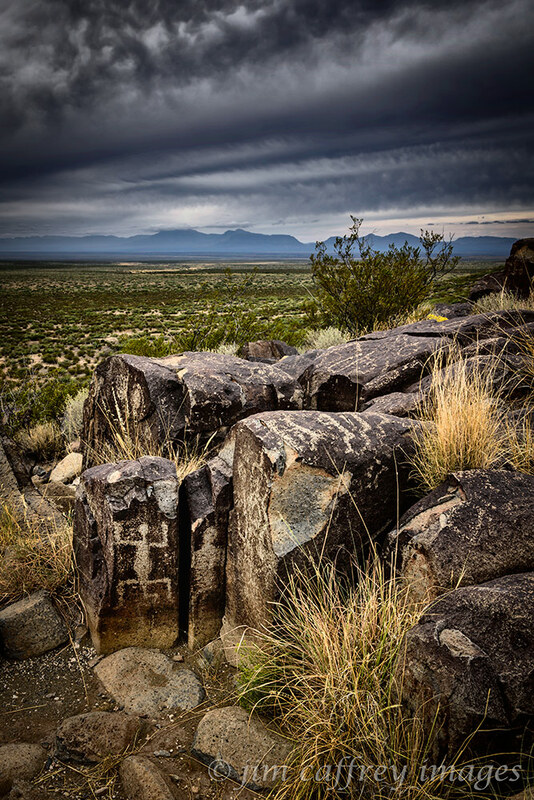 These petroglyphs are the most extensive in the Ojito Wilderness. This is just one of several panels which are scattered along the edge of a mesa in the southeast corner of the wilderness. I had seen photographs of them, and heard about them, but research into their whereabouts was sketchy. It’s like an unwritten rule that you have to work a little to find them. That’s as it should be. When I stepped onto the ledge where they are inscribed, I felt a sense of accomplishment; I didn’t exactly stumble upon them, but no one showed me the way. 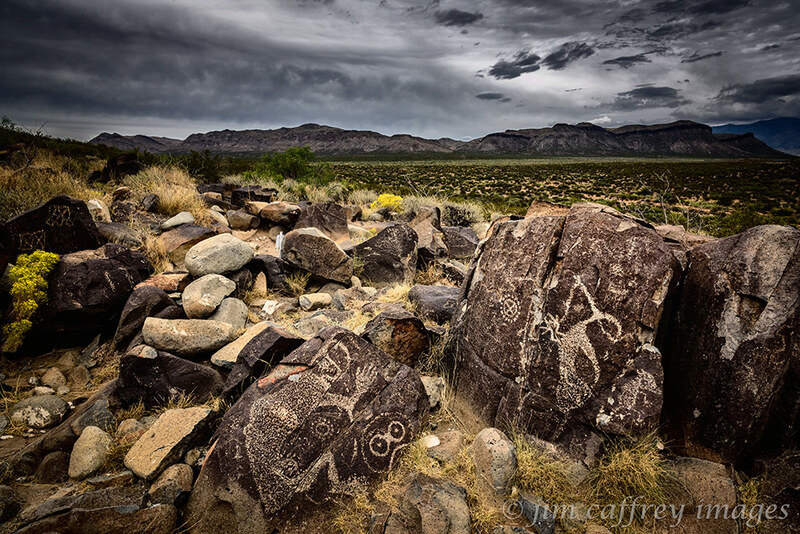 The petroglyphs are estimated to be about one thousand years old. I try to imagine an artist from that time using his tools to etch these stories into the rock. The landscape was probably not much different than it is today, and as I stood there looking out across the land to the west, I felt a connection to him. Through his drawings, I caught a glimpse of a fellow man long departed from this world. Equipment: Nikon D200, Nikkor 17–35 mm f2.8 zoom lens, circular polarizer, Bogen tripod. Processing: White balance, contrast, clarity, vibrance, and saturation adjustments in Adobe Lightroom, curves and RAW conversion in Photoshop.